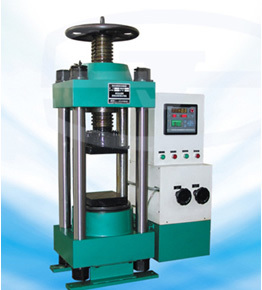 JYS-2000A digital display building materials compression testing machine is mainly used to brick, cement and concrete compression test. This machine is mainly consisted of load frame, oil source, control cabinet, digital meter. It adopts hydraulic load, oil pressure transducer to measure load, digital display, with peak value holding, loading speed function. The operation and display panel is convenient for the user to operate and observe. The load frame is four columns tower structure, mainly consisted of base, piston, crosshead, adjusting screw rod and upper & lower platen. Screw nut and adjusting screw rod are mounted on upper crosshead. Downside of adjusting screw rod, there has sphere and upper platen. On the top of screw rod, there has a handwheel, user can adjust platen position through turning the hanwheel. Reticle on the lower platen is convenient to the operator to place specimen, the specimen should be center to the position frame line. Oil source control cabinet and digital meter is connected together with load frame.